Earlier this year, I wrote about a Roasted Tomatillo Guacamole. To garnish my tacos, I wanted something simpler. Chris has been nagging me to make him some guacamole served with blue corn chips, which he finally got to enjoy on taco day (no, I didn't make the blue corn tortilla chips). 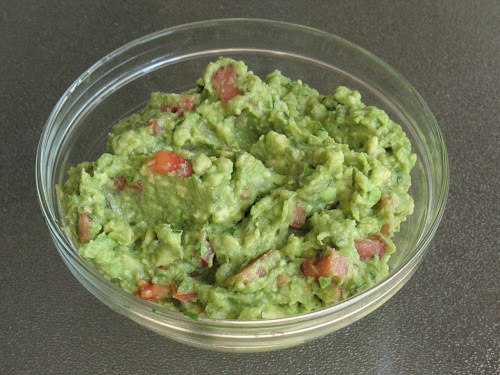 Guacamole is a really satisfying snack, perfect for summer, especially perfect served with frosty margaritas. 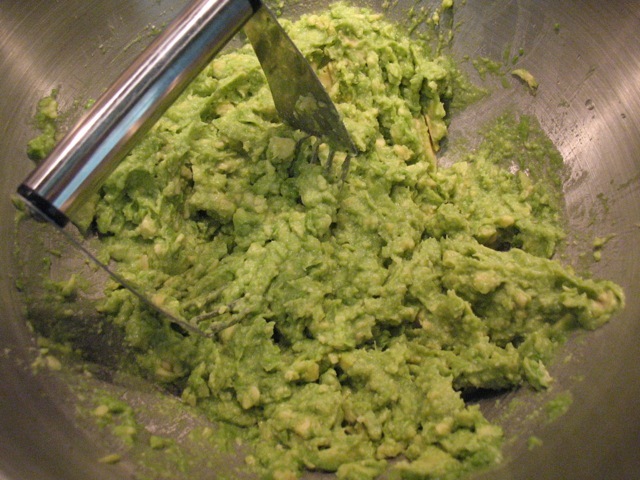 Avocados should be ripe when used for guacamole, otherwise you don't get that nice mashed texture. If they are slightly unripe, they'll still work, although you'll work more to mash them. 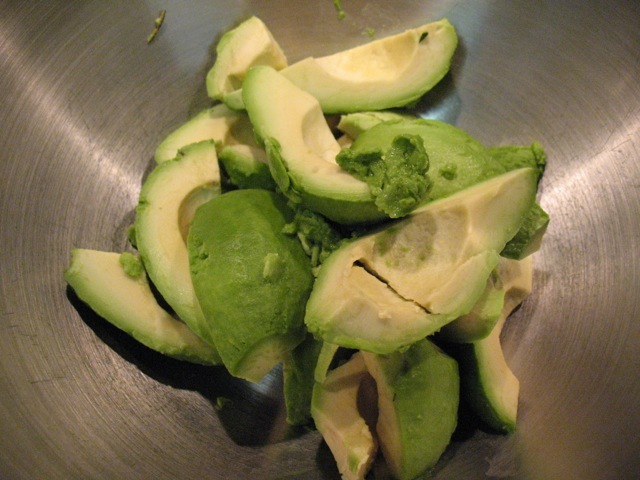 Unripe avocados will not work and are much harder to peel. If the avocados you get at the market are unripe, just leave them in the produce bag (not refrigerated) for a 2-3 days. 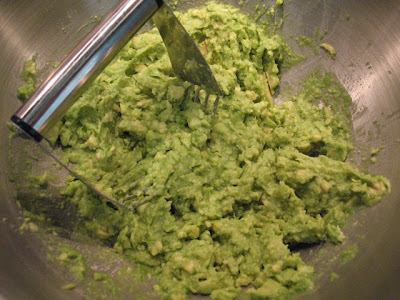 You can mash the avocado with a fork or potato masher, but I prefer to use a pastry blender, as its wide slots produce a chunky guacamole with just the right texture. To peel the avocados, run a paring knife around the circumference of the avocado the long way, cutting all the way down to the pit (basically cutting the avocado in half the long way, except the pit is in the way). Twist the two halves, one will come off without the pit. Pry the pit out of the other half. Cut the halves in half again. Use your fingers to peel the skin off the back of the avocado quarters. Peel and remove the pit from the avocados. Add to a large bowl. Cut the lime in half and squeeze its juice over the cut avocado. Mash the avocado and lime juice until it reaches desired consistency (I like mine a bit chunky, but large chunks are hard to deal with). Stir in the remaining ingredients. Serve with chips or as garnish for tacos or other dishes. If your guac wasn't so delicious, I'd take offense. Thank you for making it. And thank you for the blue corn tortilla chips. Now I'm craving both.